Here is a good link about the trail. We were on the trail at 1:59 a.m.--right on time. It was almost new moon and the temperature was close to 60. Suzanna saw the Milky Way for the first time. We practice-hiked the Twin Sisters and Halletts Peak and knew to take it easy on this hike. It was fascinating to look ahead and behind us along the trail and see the line of lights of other hikers. We arrived at the Boulder Field and waited for sunrise a half hour later before turning off our lights, putting on our helmets, and switching to walking sticks. We reached the Keyhole by about 7 a.m. after crossing over dining-room-table-sized boulders for half a mile. Photos cannot convey the in-your-face presence of the mountain when it is right there in front of you--not even stereoviews. At the Keyhole, the real hike begins. We left our hiking sticks behind the Agnes Vaile shelter and climbed over thru the Keyhole. We launched out onto the Ledges about 7:30. The Ledges are certainly narrow enough and require some hands and feet climbing, but it is the drop-off to the side of the path that is unsettling. I realized just how unsettling when we reached the skinny place where one must squeeze by a rock, grace of a couple of placed steel rods. I did it on my hands and knees up to the rock being careful to look just at the path immediately in front of me. 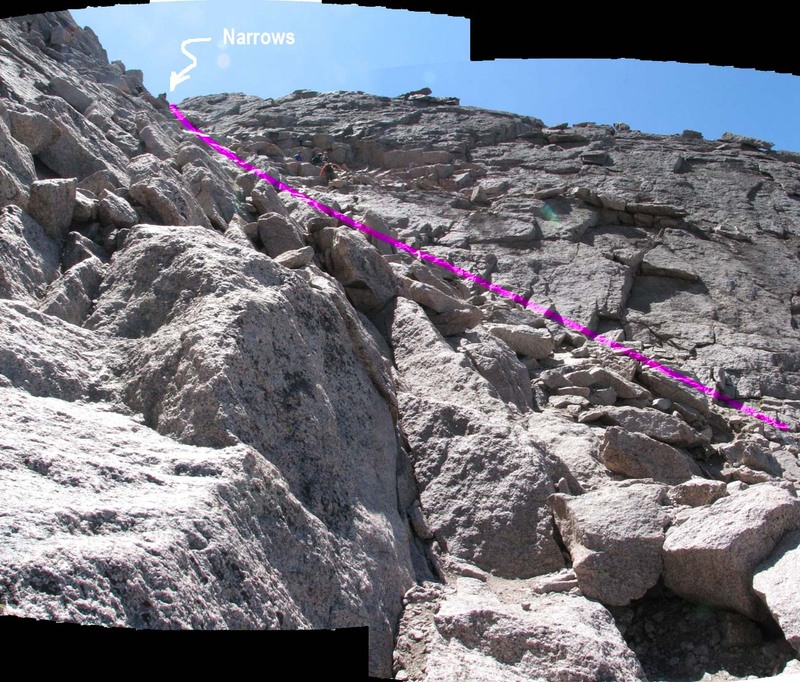 Over the length of 1/3 to 1/2 mile, the trail rises 50 feet and then descends 100 feet to the base of the Trough. It took us nearly two hours to climb and scramble up the 600 foot elevation gain of the Trough. The difficulty was two fold. First, it is on average a 45 degree incline. Second, it is completely rock and skree strewn. We would go 25 feet and rest, hearts beating. Suzanna had trouble with it due to the need to use a lot of upper body strength to pull oneself up. This is where others were appreciating our helmets. It is very easy to send rocks down onto the climbers below. We kept at it, one rest at a time and made it to the last climb at the top. The last "step" is a 6+ foot wall requiring clambering. Suzanna got help from others giving her a hand up and a foot hold behind. At this point, we encountered two-way traffic when the early climbers met us coming down at perhaps the most constricted point--the beginning of the Narrows! It was at this section that I had my doubts about going on. The drop-off exposure of the Ledges was childs play compared to what I now faced. It was only 1/8 of a mile long, but the drop-off was much steeper and smoother and the path was narrower. There was a rock that one could step around closer to the edge, or squeeeeeze by if one could. I squeezed, but began to regret it when my backpack had trouble going thru. I started talking out loud, "I don't like this, I don't like this, I don't like this one bit, Sam-I-Am." Once again I was down on my hands and knees watching the ground just one foot in front of me. I stopped half way and watched to learn what people did at the other end. All I saw were people squeezing thru an apparent space between two rocks and then disappearing. On we went. We got to that point and once more I clambered like a sticky snail over a rock trying to get some distance between me and the edge. That brought us to the Homestretch. Well, it was no longer narrow, but it was all up a slippery looking cliff face, again at 30 to 45 degrees. No rocks or skree this time...only 1 to 2 inch wide fissures running up towards the summit. Total elevation gain was 300 feet, but it sure looked like a half mile to me. At this point we came out of the mountain's shadow into sunlight. Suzanna asked me if we wanted to continue. I replied, "I'm not coming back again." So on we went. Her foot got caught in a fissure at the beginning, but finally she got it free. Rest and climb. Rest and climb. Find the next fissure. Someone just above us said they were on the summit. One quick scramble and it was true. Suzanna got there first! It was 10:30. We could not have asked for a better day. The clouds held off till mid afternoon and then only formed to the north, and those were mostly puffy ones. The summit is basically flat and boulder strewn. It is larger than two football fields. There is a rise to a north-south ridge, which divides the east from the west halves. 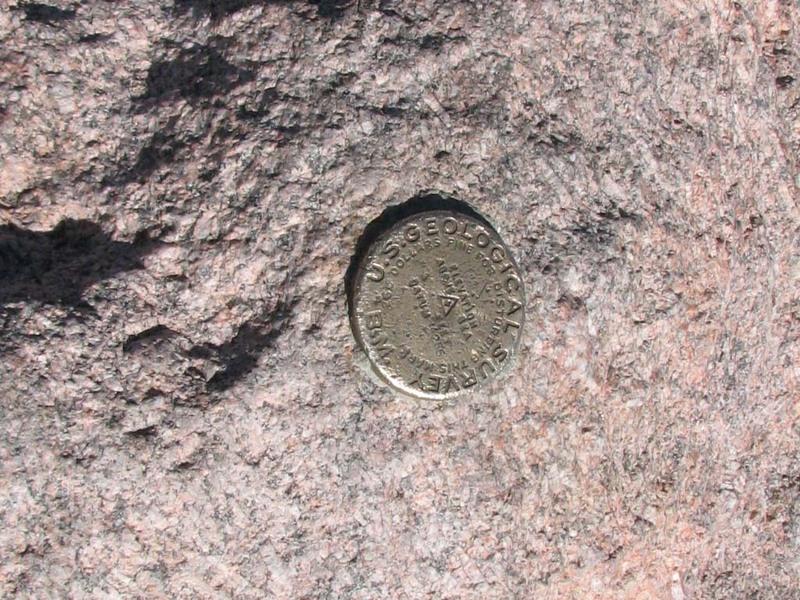 The highest point is a rock on the eastern side of the east half, marking an elevation of 14,255 feet. The only large animal we saw all day was a marmot, which appeared to live on the summit. We rested, we ate, and we walked around for an hour and a quarter before beginning our descent. We very carefully scooted down the Homestretch sitting down. Until we were back thru the Keyhole, there was NO room to start sliding. It took us as long to get down as it did going up--we were just less winded. By this time, there was very little traffic going up, so that was one less thing to contend with. Then it was back over the Narrows. I did better if I just did not think about going over it. The junction of the Narrows and the Trough is still a challenge for the height-challenged. It lies at a point where the Pagoda Mtn. 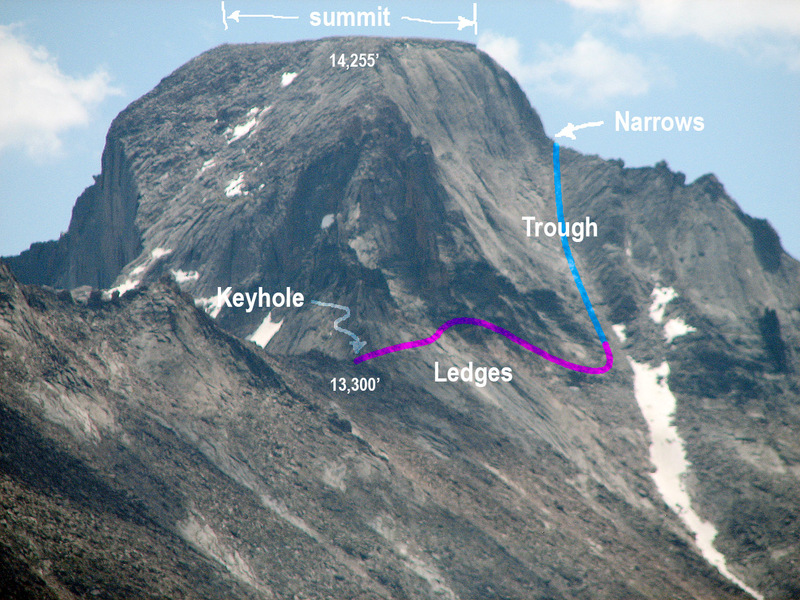 ridge connects to the southwest face of Longs Peak. People will sit on the ridge, but you have to realize that it is a good 500 to 1000 feet straignt down behind them. (Don't look! Don't look!) Then it is down the Trough. It was just as slippery going down as going up because of all the rocks and skree. I think we did it in an hour. Then along the Ledges until we came to the skinny place. We were getting tired and so we wanted to get back over the Keyhole as soon as we could. No stopping now, just squeeze on thru and then we are there at the Keyhole. We retrieved out sticks (they had been joined by two more)(etiquette on the trail is very good-people leave backpacks or walking sticks along the route and they are still there later...but they do pick up their trash) and slowly made our way over the Boulder Field. We took our first long rest since the summit where the boulders began to thin out. It was 3:30. From here it was literally all a downhill hike, but by now our feet were beginning to seriously hurt. Suzanna left her walking sticks beside the trail. At the fork to Chasm lake/Boulder Field there was a convenient facility (it is good to know there were two more in the Boulder Field). Now the day became very long. We were just covering ground as quickly as we could. If we stopped too long, we became stiff. Our feet stung. I thought mine were all blistered, but I wasn't going to find out. Coming down was the first time we saw what the trail looked like. It was too dark on the way up. So we had no landmarks to judged how long it would be. Finally a sign said it was only a half mile to the ranger station. Soon we saw the parking lot, and finally we were back at the trail register. We signed out at 6:16. We sat, rehydrated, and waddled to the car to collapse. Happily my feet were not blistered. After 15 minutes I decided I had better drive home before I stiffened up rather than take a nap. Besides, it was a beautiful, cool, puffy cloud evening, which would make a pleasant trip down the pass to home. Well, almost...driving my stick shift down the pass was a challenge. Because we were mostly coasting downhill, I needed to keep my foot slightly lifted off the accellerator. But that muscle was on the verge of cramping. It looked like my feet were dancing just trying to keep them relaxed. Finally we coasted into the driveway honking the horn to announce our return. As we pulled into the parking lot we were surprised to find it full. Dad and I had thought if we were at the trail by 2AM that we would start ahead of most of the crowd. Oh well, we checked in and started off. It was a near perfect day (or should I say night). The air was cool but not cold, wonderful for a hike. As we hiked higher and higher we caught glimpses of city lights. When we hiked above tree line, we saw the sky in full. Breathtaking! There was no moon and the Milky Way stretched from the east to the west. It was the first time I had seen it. Under the blanket of stars we headed on. I was beginning to feel the altitude and had to rest for the first time. As we looked back, we could see an endless line of lights coming from the forest below - hikers with flash lights. We could see the same up above us, lights, lights, and lights. To me, they looked like candles. After our short rest, we started off. We soon came to steps. As we stair-stepped, my legs started to hurt from the steps and my heart was beating faster. Another rest. This time when we rested we looked at the Front Range, all the city lights, hundreds and hundreds. I told Dad that I was glad to be up here rather than down there. I got up and headed on, leading the way. After about a million stone steps (well maybe not that much but that's sure what it felt like), we came to a section where the trail became a stone walkway instead of steps. Boy, whoever came up with that idea instead of steps is my best friend. Around Mt. Lady Washington we went. Up and up. We just had to be close to the Boulder Field. It seemed like we had hiked for hours (well we had). Finally we got there. I was very thankful for a rest. I needed it. While Dad and I rested, we watched the sun come up. It was beautiful. It started as this orange yellow color then divided into bands of orange, red, and yellow. I had never seen the sunrise turn such a red before. We sat there and soaked it all in. When we had enough light, we started toward the Keyhole. Climbing from the Boulder Field to the Keyhole was a pretty steep climb. I kept on getting out of breath and my heart was pounding. Rest, go on, rest, go on, this was our pace up to the shelter. At the shelter, I rested while Dad put our sticks behind it, then we climbed to the top of the Keyhole. On top, I rested and prepared my bag so things wouldn't stick out the sides. Dad took pictures and ate. Soon we were ready to go on. As we started across the Ledges, I tried not to look down. On one side of you is a drop of sheer rock and on the other well... not much to hold onto. As we slowly made our way across, I kept looking ahead at the Trough. It looked intimidating and, as I found out when we got there, it was. From where I was, it almost looked like a 45( angle. But it was only like a 30( at the steepest part. We would climb for 20 feet up the Trough then catch our breath; it was slow progress. While you climbed, you had to be careful not to send rocks and skree down on other climbers. After what felt like two hours (I don't know if it was, but it sure felt like it), we arrived at the top of the Trough. As I looked down, I didn't know if we could make it back down the Trough. Dad said not to think about it. We rested and let people pass, then we started out on the Narrows. The Narrows definitely lived up to its name. You have about a 3-foot ledge that you walk or crawl on, and a 500 to 1000 foot drop on your right. I was prepared for the worst. It actually wasn't as bad as I thought, but you have to realize that Dad and I are afraid of heights. I thought that challenge was the best part of the hike - no having to climb up or down, just strolling across a little ledge. Dad had a little more trouble though. We got to a point where he got extremely uncomfortable and asked if I wanted to go on. I don't blame him. If I knew what was coming, we might have turned back. But I didn't, so I convinced him to go on. We climbed up between two rocks and got our first look of the Home Stretch. It doesn't look nearly as steep in the pictures. As we started climbing toward the top, I realized that I needed a longer rest than we last had before beginning the Narrows. So we stopped and rested, watching people go up and come down. As we started climbing I began to doubt whether or not we could make it. I asked Dad his opinion. His response was he was only going to do this once so we might as well get to the top. I asked him to go first. This was one of the worst parts of the hike. You are very tired and ready to be at the top and done. I was lagging a little behind him when suddenly my foot got caught in the crevasses. I could not get it out. First, I did not panic; next I twisted my foot back and forth. Thankfully there was a nice man behind me who gave me advice. Soon I got my foot free and caught up with Dad, who was a little ways above me. I rested and let my adrenaline settle down, then we started off once again. We came to some rocks where you could either go on one side or the other. Dad took one way and I the other. My choice was the one where people would come down, but there was no one coming down when I went. I decided to try to make it on top first. I scrambled up as fast as I could and suddenly I was on top. I looked back just in time to see Dad come up. We were on top and I had made it first! It was a great feeling because our goal had been accomplished and my dream of being the first one in our family to reach the top had been fulfilled. But now, you mean... we have to go down?!?!?! 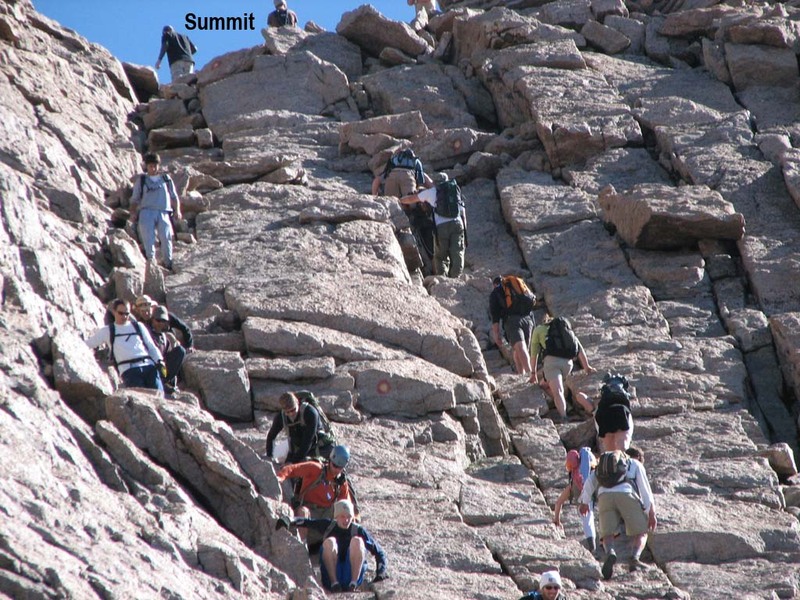 Never again will I climb Longs Peak. It was too much for me; I didn't feel like I had enough energy to ascend that mountain. 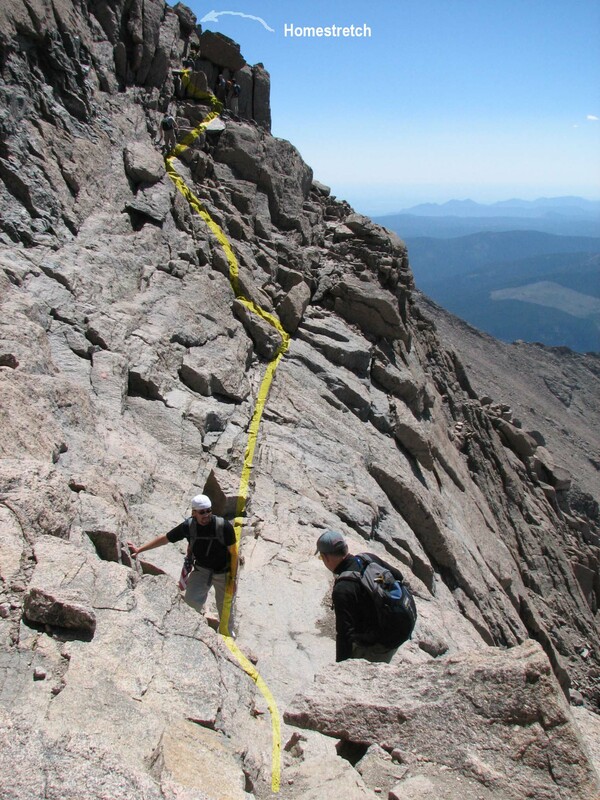 Though I do love mountains and the view you have on top, I'll leave Longs Peak to the more experienced climbers that like that type of thrill and aren't afraid of heights! After we coasted into the driveway and honked the horn and all had gathered around, they asked, "how was it?" to which we answered... "There are hikes and there are climbs, and then there are accomplishments. This was the latter. We are glad we did it. We will never do it again." Honestly, if one has difficulty with balance or heights, one has no business going past the Keyhole. And most certainly you do NOT want to be caught up there in wet weather! We are surprised that only 60 people have died on this route over the years. 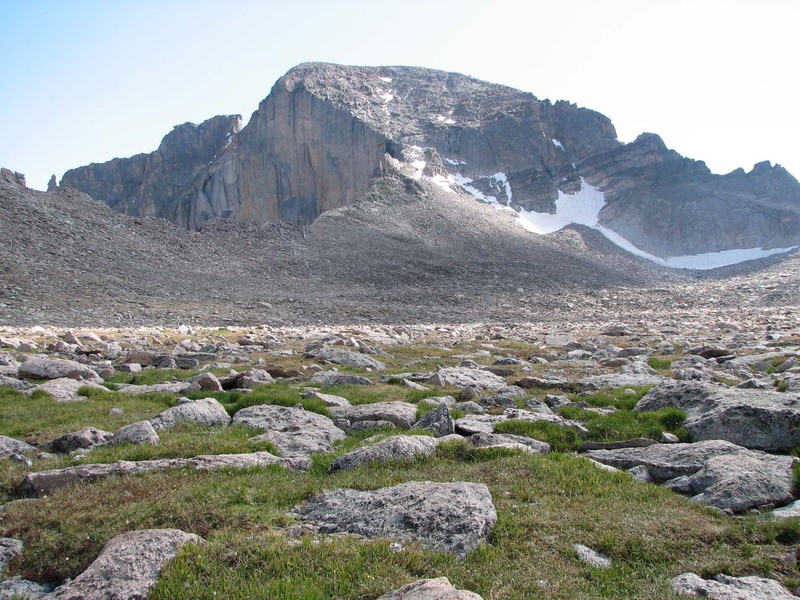 But if you just want a good hike, go up to the Boulder Field. Do it in the middle of the night and watch the Milky Way slowly go east to west overhead and wait for the sunrise. You will be have a memory to share. Although it did not hurt after the hike, my right knee did not seem quite right. In December after another weekend warrior day, it became very bothersome. And it became worse such that I started limping and avoiding stairs. I tried padding in my shoes, I tried my exercises I had given up two years before, I tried vitamins and minerals, and nothing made a significant improvement. By April, I was seriously thinking I might not be able to hike again. Then in May, we prayed healing on it by way of Jesus (and for my other leg to even out its length - it was slightly shorter and had been so for decades.) Lo and behold it started improving immediately and I was able to begin using it normally. It gradually strengthened back to near normal (still some brief twinge every now and then.) And in July I was hiking into the Rawah Wilderness with a 35 pound pack. 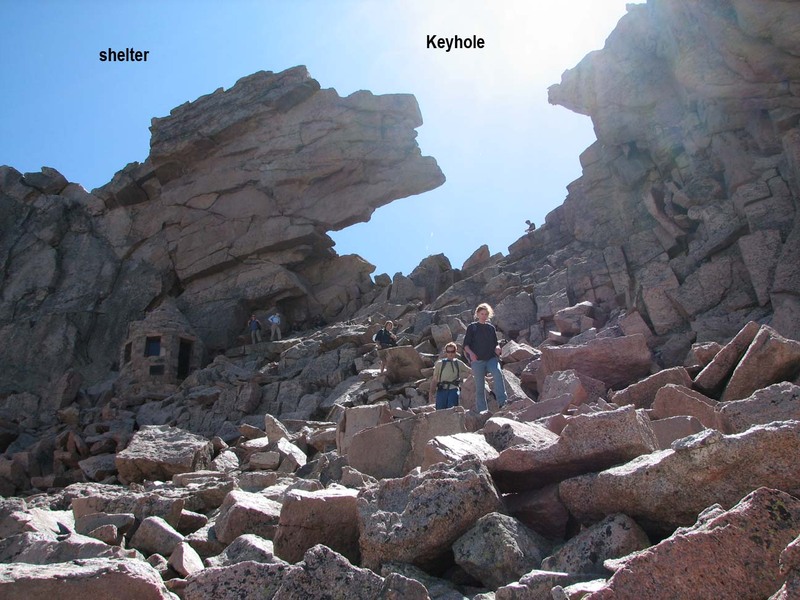 So be careful about your knees coming down from Longs Peak! 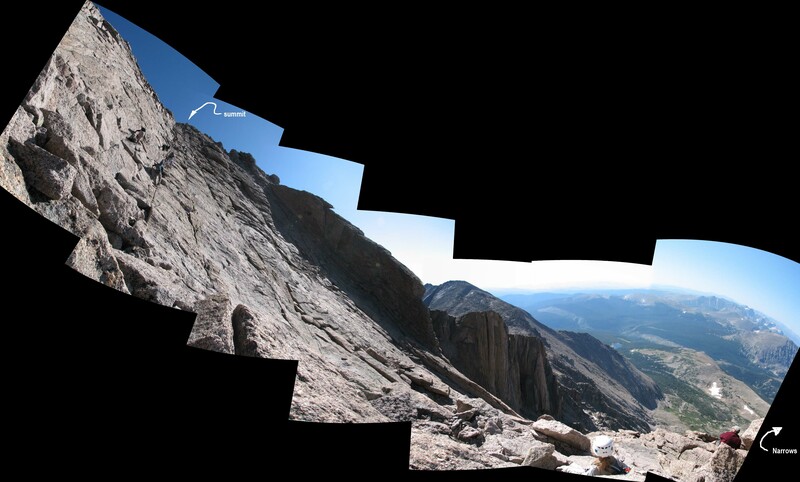 Okay, mabe I said I would never climb Longs Peak . . . but the more I'm thinkng about it . . .